We’ve been going hard with the scary lists for the past two weeks, and I hope I didn’t ‘fraid ya too bad! I decided to take some time away from the extensive world of Listicles and film criticism with a light, fun list to remind you of all the spoopy fun out there! So today, we will be looking at the Ten Best Saturday Night Live Halloween Sketches! The list is a simple one: I’m going to share with you all the ten funniest, most influential Saturday Night Live sketches set around the Halloween season. The requirements are loose: it just has to be a Halloween-based sketch, and it has to have been in the last episode before the show went on hiatus, whether that’s the week before Halloween or the beginning of October. Hell, this list is so loosely organized, I’m not even going to rank them, just post them in release order (also because choosing between SNL sketches is like choosing a favorite child). We’ll just take a nice, pleasant look at the list, enjoy a brief summary of what makes these sketches great, and then have a good laugh. This list is the friends we made along the way. Now, before we get to the Top Ten, I want to take a look at some of the sketches that made my Honorable Mentions list, just falling short of the Top Ten. There were a lot to choose from, including “The Zimmermans” and the now-classic “Clinton Halloween Party,” which introduced a generation to a young up-and-comer named Barack Obama. There’s the individual successes of Chris Farley’s “Matt Foley: Halloween Edition,” Kyle Mooney’s “Bruce Chandling,” Bobby Moynihan’s “Drunk Uncle on Halloween,” or literally any Halloween song Jimmy Fallon or Adam Sandler dragged out every year. There’s also the ensemble work seen in “Garth and Kat’s Halloween Songs,” “The McLaughlin Group Halloween,” and Edward Norton’s “Halloween Candy.” I came dangerously close to picking the Jim Carrey/Taran Killam team-up “Graveyard Song,” aka Paul and Phil (watch it on YouTube, it’s great), and for recency, I almost went with “A Frightening Tale” from this year’s Halloween episode, which is the most painfully accurate thing I have ever witnessed. And yet, as great as these sketches are, I’m still quite happy with my Top Ten. And with that settled, it’s time to look at the Top Ten Saturday Night Live Halloween Sketches! 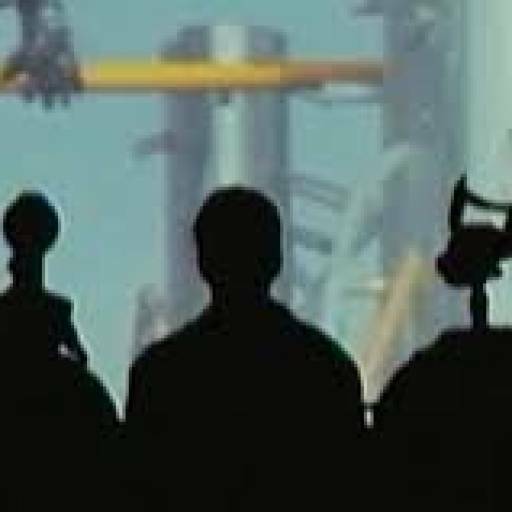 Sure, “Bat-O-Matic” is just a retread of the much more famous Halloween sketch “Bass-O-Matic.” However, just because it’s a retread doesn’t mean it can’t be just as funny. That’s what recurring characters are for. And while Dan Aykroyd’s salesman of ridiculously dumb blenders is always great, there’s something about his warlock-themed character trying to sell a bat-blender to witches brewing potions that’s just ingenious. I mean, listen to the inflection he puts on each ridiculous word, beckoning people to buy yet another dumb product. It’s not only a clever, funny sketch on its own, but it’s packed with satire and parody of the sales pitches 70s TV viewers would see every night. This is the perfect first Halloween sketch, and the perfect way to start off this list. Most people have forgotten by now that former-Senator Al Franken was, at one point, a key member of the Saturday Night Live family. Not only that, but he created one of the greatest characters in the history of the show: Stuart Smalley, the effeminate runner of an Alcoholics Anonymous-inspired therapy show – despite his non-professional status (every episode begins with the disclaimer that he is not a licensed therapist). Here, Smalley is at the top of his game, crafting hilariously on-point imitations of the types of people you find giving inspirational pep talks. And when Smalley launches into his “Scary” story, it’s a master class in comedic delivery, facial cues, and vocal delivery. I’ve never been the biggest fan of Smalley, but when it comes to Halloween sketches…it’s good enough, it’s smart enough, and doggone it, people like it. Truth be told, I always liked, but never loved “Vincent Price’s Halloween Special 1959.” But then again, I’d never seen a James Mason movie to understand how brilliant Jon Hamm’s performance was. “Halloween Special” is a master class of parody, effectively spoofing the silliness of Halloween specials, and particularly washed-up 50s stars who had backslid into campy horror movies. While the sketch is centered by the frustrated, hilariously voiced Vincent Price, as played by Bill Hader, it is the side characters who really steal this sketch. Each actor effectively sends-up the onscreen (and real life) personas of their characters, and each does so in a way that ruins the show for the energetic and exasperated Price. There’s Hamm’s Mason, a performance I didn’t fully comprehend until I saw the ’54 A Star Is Born and realized how spot-on it is. There’s Fred Armisen’s Liberace, which he plays with appropriate flamboyant gusto in the way only Armisen could. And then there’s my beloved Kristen Wiig basking in the glory of Gloria Swanson from Sunset Blvd. It’s one of the greatest performances of all time, and Wiig sends it up perfectly. It’s a fun, dumb sketch that will live forever in Halloween infamy. This is perhaps one of my three favorite sketches on this list. “Jeff Montgomery” is the perfect example of what happens when the showrunners say, “Fine, ok, put anything you want on in the 12:55 slot.” Because in no way should this sketch have been allowed to air, in theory. It’s dark, it’s morbid, and yet, it’s somehow endearing. Jon Hamm is a fantastic comedic actor, but he is often at his best when he gets to play the straight man. And here, he gets to play the ultimate straight man opposite Will Forte’s Jeff Montgomery. From minute one, Montgomery is a little bit off – a forty-something-year-old man without a costume trying to trick-or-treat is a weird visual. What’s better, Forte’s line delivery as he delivers a series of tacky jokes is even more unsettling. But as he explains himself and Hamm comes off-edge, things begin to settle down. And that’s when the sketch does it – it goes there, catapulting itself from good to great with a twist I won’t spoil here, but will leave you shocked, and perhaps even screaming. And as the sketch only continues on from there, it offers no respite from the horrifically hilarious joke at the center of it all. Watch below and revel in Forte’s genius, but be warned: this is an incredibly dark sketch, in all the right ways. Whenever Saturday Night Live allows Taran Killam and Bill Hader (along with the guest of the week) to play the Merryville Brothers, I am immediately onboard. While the idea of animatronic figures coming to life to murder me is, in fact, one of my deepest fears, watching the three (and here, four) Merryville Brothers ridiculously and hilariously slowly come to life, harass, and eventually kidnap/murder the main couple is always a treat. There are always three highlights to a Merryville Brother sketch: how robotic the actors’ movements are, the heightening sense of tension, and the final twist. For these reasons, the Halloween sketch may be their highlight – Bill Hader holding a chainsaw, the surprise appearance by a beloved Hollywood figure, Jay Pharoah’s face on the tombstone…hell, even Bruno Mars, whom I do not think is talented in the slightest, does a great job as the third Brother, especially the look on his face while he smokes a cigarette. It’s a weird, wonderful sketch, and one of the best of the Halloween lot. From the same episode, we have perhaps beloved character Stefon’s crowing achievement (and yes, Bill Hader has appeared in three of these, because he is a treasure). This sketch has everything: Bill Hader breaking, Seth Meyers milking his straight man role for all its worth, MY SON…the brain child of Hader and John Mulaney has rarely been as wonderful as he is here. Hader relishes each ridiculous turn, from the existence of his son to his pronunciation of “Jellybones,” from “a glass of champagne…or is it piss” to his emphatic description of what a “Slimer” is (it is so wonderfully filthy I don’t think I could do it justice by writing it out). And I’m not sure Stefon has ever had a funnier line than the Jewish answer to Blacula, the Black Dracula: Sidney Applebaum – a line so funny it broke its deliverer (I would assume this is one of the infamous lines Mulaney would slip in to break his cowriter). Stefon is one of the greatest Weekend Update characters of all time, up there with Roseanne Rosanneadanna, Drunk Uncle, and Tommy Flanagan, and this is the gem in the center of his many, many rings; a tour-du-force that should have earned Hader an Emmy many, many years ago. God Bless Bill Hader, and God Bless Stefon. You know, sometimes the best SNL sketches are the ones where the cast just wants to have fun with the audience, both in theater and at home. And that’s exactly what happens with “Halloween Costume Contest” from Jim Carrey’s Halloween episode in Season 40. While it would have been just as easy to pick Graveyard Song (“Paul and Phil, Paul and Phil…”), I just can’t get over the pure joy of the Costume Contest. Sure, it doesn’t start out that strong as we meet the people competing in the Costume Contest, and a slightly offensive boss played by Vanessa Bayer shames both Sasheer Zamata and a “trying her best” Aidy Bryant. However, things pick up once we see an over-dramatic Kate McKinnon dressed as Maddie Ziegler in Sia’s “Chandelier” music video. And things only improve more when host Carrey steps out in the same costume. And when the boom box comes out, the sketch becomes unstoppable. Carrey and McKinnon are two of the most physical performers out there right now, and watching them throw themselves around the set, out into the audience, and around Studio 8H in a hilarious show of comedic prowess. From their dragging themselves across the floor to Carrey’s calisthenics to Carrey’s twirling of McKinnon, it only gets better and better as it goes on. Throw in an appearance from Lorne Michaels and the Only Likable Thing Iggy Azalea has ever done, and you have an all-time Halloween classic. You knew it was coming. I’ve written about this sketch far too many times for it not to appear on this list. 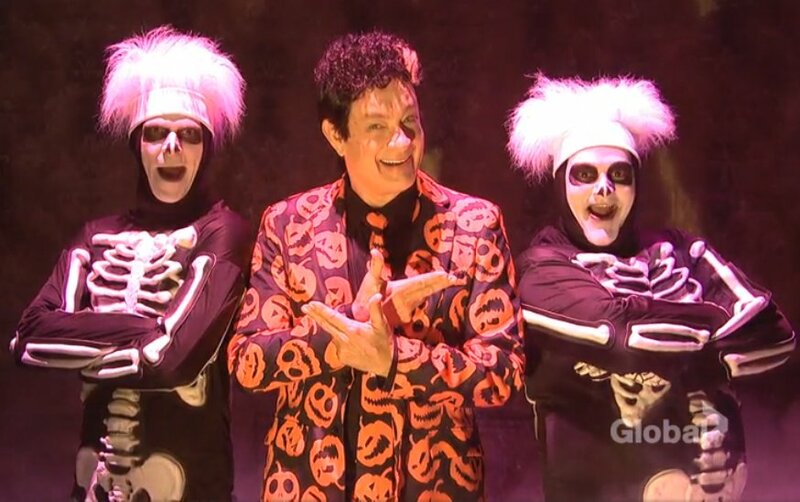 Of course you can’t have an SNL Halloween without “Haunted Elevator,” the sketch that started as a spooky Haunted House before the arrival of Tom Hanks, declaring that he is, in fact, David S. Pumpkins. What exactly is David S. Pumpkins? He’s HIS OWN THANG!!!! All we know is that he’s here to scare the hell out of you. And to dance. Oh, does he dance. That’s why he has his sidekicks, two skeletons played to perfection by Mikey Day and Bobby Moynihan (who wrote the sketch with Streeter Seidell. Day and Seidell love writing sketches where the host plays a weird figure, and the rest of the sketch is based on one or more characters trying to figure out what the hell is happening, and Pumpkins may be their magnum opus. The sketch works for a variety of reasons, from Bennett and McKinnon’s straight men to Melissa Villaseñor and Leslie Jones’ actually-frightening Haunted House figures (making Pumpkins all the more of an outlier), but it mostly works because of Hanks. Hanks, despite clearly not understanding the joke, gives the sketch his all, from the goofy costume to the absurd facial expressions to the wacky dances. This is one of the dumbest, strangest, funniest sketches Saturday Night Live has ever done, but there is a reason it is the only sketch to inspire a spin-off Holiday Special: because David S. Pumpkins is love, David S. Pumpkins is life. And finally, we have one of those instant classic SNL sketches that seems innocent in its simplicity, but has some innate level of inner truth that makes it memorable for generations to come. “A Girl’s Halloween” doesn’t have many major moments – host Tom Hanks doesn’t even appear. However, it etches its place in the upper echelon of Halloween sketches because of its funny, brutal, honest, and loving treatment of twenty-something girls trying to celebrate Halloween. Intercutting between now-legendary performers Cecily Strong, Aidy Bryant, and Vanessa Bayer getting ready for Halloween as a cat, a mouse, and cheese, respectively, and the inevitable 4:00 am comedown after the booze has entered their system, the trio really speaks to the core of female friendships after drinking too much. There’s the self-loathing, the fluxuation between love and hate, the anger, the giddiness, the hunger, and the tears – oh god, are there tears. There’s the quest for pizza, the fighting over booze-concocted slights, and the struggle to walk down a New York street in heels. There’s a reason that most of the laughter in the audience comes from the women in the audience – they’ve been there. This sketch knows exactly what it’s doing, and it never condescends to its main trio – it only lovingly pastiches, with a specific care that makes good art great. And that does it for today’s Sacred Walloween Listicle! I hope you enjoyed a look through Saturday Night Live’s Halloween archives – and if not, why not let me know in the comments which sketches you enjoyed! There’s nothing more fun than sharing SNL sketches among friends. 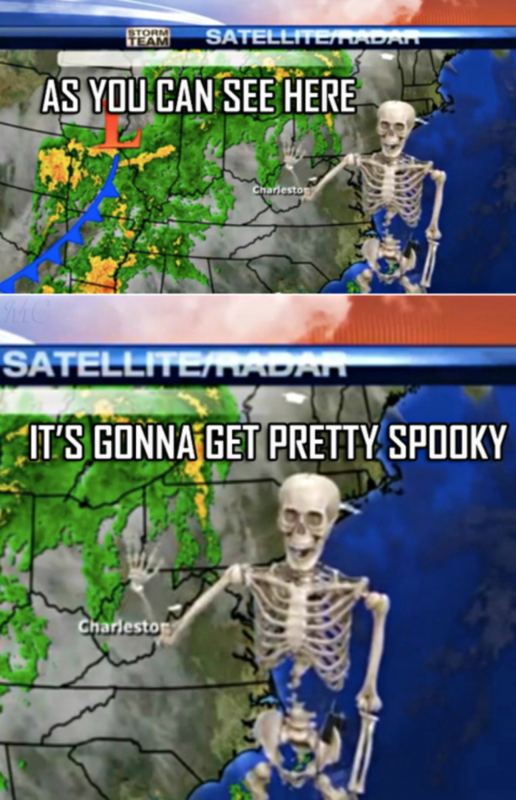 I’ll see you all next week with another spooky scary listicle, and until then, stay spoopy, my friends.